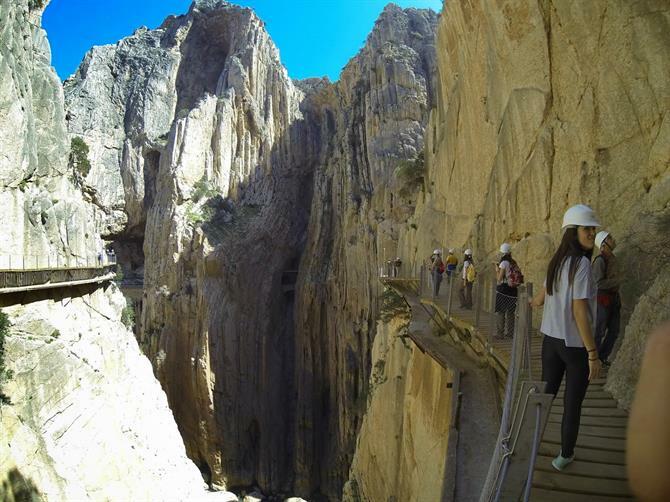 The opening of the newly reformed Caminito del Rey, also known as El Camino del Rey, has been one of the most anticipated events in recent years. The new pathway has been making headlines across the world, with Lonely Planet recently nominating a walk along the Caminito as one of the hottest things to do in 2015. 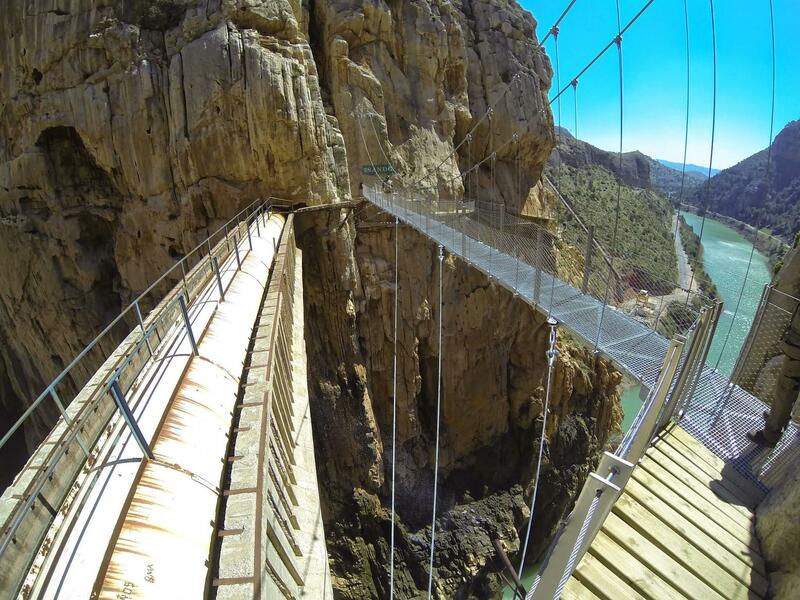 The official opening of the Caminito del Rey was on March 28th 2015. Here’s what to expect. The Caminito was originally built between 1901 and 1905 and was used to transport material and people between two power stations that were built either side of the El Chorro gorge. It wasn't until the early 1920s that it was officially opened by King Alfonso XIII who walked its whole length and gave it its name. Since that time, the Camino has become one of the wonders of Spain. The El Chorro Gorge (La Garganta del Chorro) is an amazing place, with huge walls of rock as high as 400m along its three-kilometre length. “El Chorro” can be loosely translated as the "spurt," which is exactly what the water used to do when travelling through the gorge’s narrow ravine. The height difference between the two man-made reservoirs at either end of the gorge provided a unique opportunity to develop hydroelectric energy. An almost revolutionary concept at the time. This danger became the stuff of legends and attracted climbers and adrenaline junkies from all over the world, with many people referring to the Caminito as the ‘world’s most dangerous pathway.’ This is what the Caminito del Rey looked like in 2013 just before the reforms started. The government spoke of reforming the Camino for years. In late 2013, these plans finally came to fruition. The local authorities and the city of Malaga are sharing the total €5.5m renovation cost. €2.2m have been used for the new construction of the new Caminito, the rest is destined for additional services in the area, roads, parking and bus facilities. It promises to be one of the largest attractions in Andalusia, if not the whole of Spain. Tickets have to be reserved online and can be done so on the official Caminito del Rey website. For the first six months, entrance was free. After this six-month period, the entrance fee is €10 per person. Guided tours are also available. The maximum number of people allowed on the Caminito at one time is four hundred. Groups of up to fifty people are allowed through the initial control points, with slots allocated every half hour. A maximum of 1,100 people per day is allowed to walk the Caminito. The initial opening times are listed below. The total distance to walk the new Caminito del Rey is 7.7 km. You walk from Ardales in the north to southern Álora. For some additional pictures of the new Caminito - see Spain Holiday's Facebook page. This route follows the river downstream and takes about 4 hours. The route starts just off the MA-444 access road that winds around the Ardales lakes. There are several ways you can get to the start of the Caminito from here. You need to get to the other side of the mountain. There’s a small tunnel that is situated just beside the Kiosk restaurant, right in front of the Conde de Guadalhorce reservoir. The tunnel is short, but you need to walk further at the other end (approx. 2.5kms). The path is exceptionally picturesque, signposted and follows the course of the river until you reach the control point/entry. There's a larger/longer tunnel that is situated near the Mirador restaurant. This tunnel is quite a bit longer than the one near El Kiosk, but you save time walking on the other end. At the time of writing, there were no lights installed. Bring a torch or headlight if feeling unsure. If you don't want to use the tunnels, you can easily walk over the mountain and drop back down to the river. Follow the track that runs behind the Mirador restaurant. You can't miss it. The control station is situated just next to the old hydroelectric plant. Once you pass through the control, the path quickly narrows and gets increasingly vertical as you progress into the Desfiladero de los Gaitanes. You eventually drop down into the Valle del Hoyo. The old Caminito has been left as intact as possible with the new path built just above it. It's made up of predominantly wood panels that have supports drilled into the rock face. 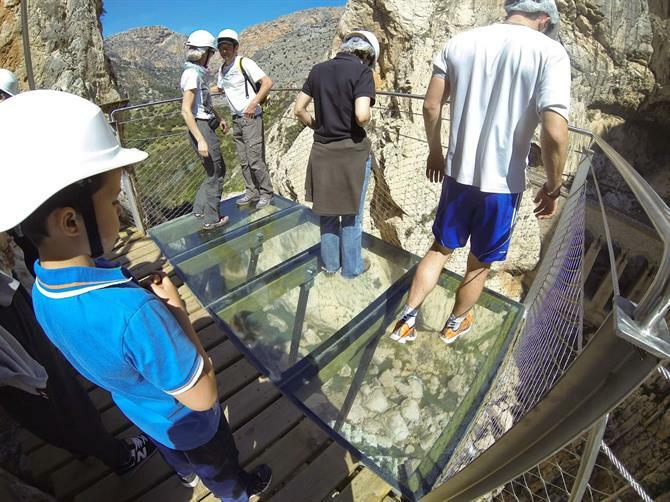 The one-metre wide path offers several spectacular glass floor sections and culminates with a hanging bridge that crosses above the Balconcillo de los Gaitanes. Not for the faint-hearted, the bridge is suspended more than 100m off the Gaintanes gorge. The Caminito should not be attempted if you are of a nervous disposition or suffer from vertigo. You will be provided with a helmet upon entry. It must be kept on at all times. There are no bathrooms or facilities throughout the entire route. Bring water and food with you. Children need to be accompanied at all times and must be over 8 years old. Access can be closed during high winds - over 35 km/h. The walk is linear. You start in the north and end in the south. There's a bus service that connects the two sides. Buses leave every half an hour, with a single ticket costing €1,55. You can buy the bus tickets together with the tickets for the Caminito. The bus from the El Chorro side leaves from the first roundabout just before arriving at the train station. The bus from the Ardales side leaves from El Sillón del Rey - the King's chair - a few hundred metres down the road from the Kiosk restaurant. El Sillón del Rey is a stone table and chair that was dedicated to the opening of the reservoir. The same reservoir they had to be fished out of having been thrown into it during the Spanish Civil War. On leaving Málaga follow the A-357 northwards towards Cártama. Stay on the motorway for 65 km, just after you pass the village of Ardales on your left hand side, keep your eyes open for a sharp turning rightwards. It's labelled M-442/Ardales/MA-5403/El Chorro. Take an immediate left onto the secondary road MA-444 which quickly starts to wind around the Guadalhorce reservoir, providing some fantastic scenery. Keep following this road as it winds around the lake. You'll eventually come to a junction, with a sharp turning rightwards towards the village of El Chorro. Rather than turning rightwards, keep on the MA-444, driving past the campsite and the beach areas. Just before a small tunnel, take a sharp right onto an unpaved forestry road. Signposted Restaurante El Mirador. Drive up a couple hundred metres and park anywhere you can. The tunnel is clearly visible and signposted. There are two options for parking: the car park of the train station in Álora (at the exit of the route), or the car park at the Conde del Guadalhorce reservoir in Ardales (at the entrance). For more information about the itineraries, check the Caminito's official page. There are currently only two trains that leave daily from Malaga's Maria Zambrano station to El Chorro. The first leaves at 10.05 (destination Ronda) and the second at 16.48 (destination Sevilla Santa Justa). Journey time is 40 minutes and a ticket costs 6€. There are three trains that return from El Chorro back to Málaga. Leaving at 9.33, 15.03 and 18.03 from El Chorro. Additional train services have been planned for the future. For more information, see the Renfe website or call 902 320 320. For more things to see and do in the area, be sure to check the fantastic hike up the Arabic staircase or pay a visit to the Bobastro ruins. 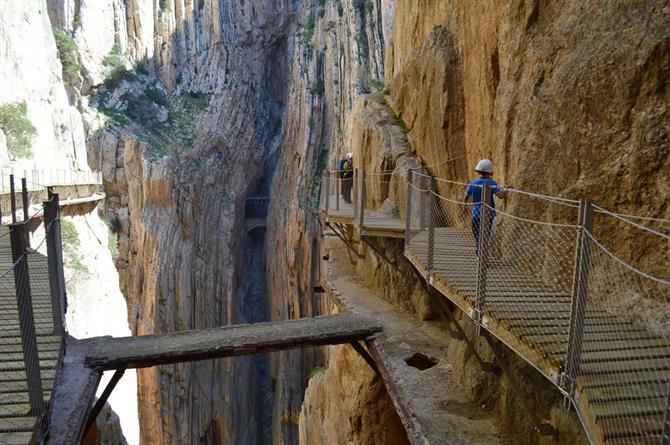 El Camino del Rey, also known as the Caminito del Rey, the King’s little pathway is high on any adrenaline-junkie’s bucket list.